Valve Software said Friday that it will ship its prototype Steam Machines to 300 lucky beta testers, ranging from premium boxes based on Nvidia Titan cards down to low-end Intel Core i3 machines. But in an interesting twist, all of the Steam Machines use an Intel CPU and an Nvidia-based graphics card, not AMD's CPUs and GPUs. Valve's announcement comes as Origin PC, a boutique PC maker, also said Friday that it will shift entirely to Nvidia GPUs. Moreover, Valve said that it plans to make the Steam Machines open and user-upgradable. So if users want to upgrade their Steam Machines, they can, Valve said. 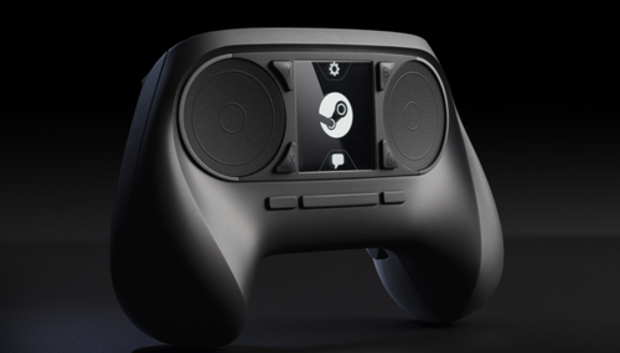 Valve's Steam Machines were tipped off more than a week ago, when Valve announced its Steam OS, the Steam Machines, and a related Steam Controller (above). Steam OS will be Linux-based, and will run an undisclosed library of games on what Valve is billing as open hardware. The company will even provide the source CAD files for its enclosure, Valve said in a blog post. However, the company said it was not yet ready to publish pictures of the proposed box. "And to be clear, this design is not meant to serve the needs of all of the tens of millions of Steam users," the company wrote. "It may, however, be the kind of machine that a significant percentage of Steam users would actually want to purchase--those who want plenty of performance in a high-end living-room package. Many others would opt for machines that have been more carefully designed to cost less, or to be tiny, or super quiet, and there will be Steam Machines that fit those descriptions." But Valve's beta program suddenly looks like an improved version of Google Glass, where Valve will ship hardware worth potentially hundreds of dollars to consumers to test, but without Google's requirement that they pay for the privilege. To get in on the beta, however, consumers have to jump through a few hoops: join the Steam Universe Community Group, agree to the terms and conditions, make ten Steam friends, create a public Steam profile, and play a game using Steam's "Big Picture" mode. Users need to accomplish all this by Oct. 25, when the beta program will be locked; however, they can also track their progress using a special "quest page" attached to their Steam profile. Upon completion of the beta "quest", Valve will award a special badge. About 260 of the 300 beta participants will be selected randomly, the rest from previous contributions to the Steam community, Valve said. The Steam Machines themselves will measure 12 inches by 12 inches by 2.9 inches, and contain a 450-watt power supply. On the high end, the combination of just the Nvidia Titan GTX 780 (a $649 part) plus the Core i7-4770 (about $300 or so) means that the prototype game machines should easily top $1,000. The lower-end machines will still feature a nice selection of game hardware, compliments of Valve. "We're still not sure if it's a competitor to our Tiki, or a huge endorsement of the Micro-Tower with almost identical specs as the ideal Steam Machine," Kelt Reeves, chief executive of Falcon Northwest, said in an email. What's unusual, however, is that the prototypes exclude AMD, a minority player in the CPU market but the second-ranked vendor in the GPU market. Viewed another way, AMD is the largest GPU vendor besides Intel, whose dominant market share in the CPU market (and whose Core chip integrate graphics hardware) have pushed it to a 62 percent share, according to Jon Peddie Research. AMD is next with a 21.9 percent share, followed by Nvidia at 16.1 percent. Valve representatives did not immediately respond to PCWorld's request for comment. But the issue is slightly more sensitive, given that Origin PC said Friday that it would forgo AMD GPUs, because of "many factors including customer experiences, GPU performance/drivers/stability, and requests from our support staff," that company said in a statement to PCWorld.